★ Mobile office more convenient. ★ HDMI audio and video synchronization. ★ Type-C Interface Fast Two-Way Charging Using the Hub to transmit data, it is also possible to charge the notebook or the device. ★ Special storage package presented small and exquisite appearance, easy to carry. ★ Support fast charge, charge transfer correct and efficient work office essential Mac partner. 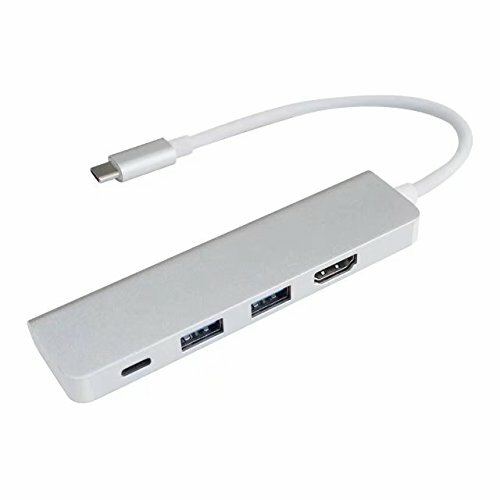 ★ Applicable to MacBook, Chromebook, Dell and other USB-C laptop dual USB 3.0, support 4K HDMI transfer, charging function. ★ Provide extra 2 USB 3.0 ports supporting up to 5 Gbps transfer speed(downward compatible with USB2.0) and 2 slots for HDMI/Type-C, support 4K HDMI transfer. ★ Suitable for Apple Macbook , Google Chromebook Pixel,Samsung TabPro S, and other Type-C enabled devices. ★ Extension adapter to connnet multiple devices/accessories to your device such as mouse,portable HDD,USB,memory card and camera. ★ Support a great variety of card type: SD,SDHC, SDHC UHS-I, SDXC,SDXC UHS-I, microSD, microSDHC, microSDXC UHS-I, microSDHC, microSDXC UHS-I(Max 2TB).